The Bears led for almost the entire game, but pretty much everybody watching the game knew what was coming when San Francisco got the ball back down 14-12 with just over 4 minutes to go. The 49ers methodically marched down the field and longtime Chicago kicker Robbie Gould drilled his 5th field goal of the day to send Chicago to their 5th straight loss. Chicago’s offense came out on the first possession and ran the ball twice in a row out of heavy sets. Anybody who’s watched Chicago this year can already guess how that ended: with Chicago in 3rd and long. That led to a sack of QB Mitchell Trubisky for a nice quick three and out. 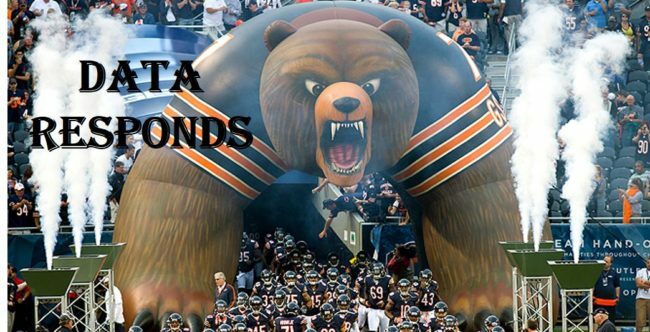 Speaking of running on first down, the Bears did it 11 times in 14 chances today. Only one of those runs went for more than 3 yards; most went for 0 or 1. It looks like any confidence rookie quarterback Mitchell Trubisky earned from the coaching staff completely evaporated after a bad game last week. They finally opened things up two weeks ago, and the offense shockingly had their best game of the year. Now they’ve had back to back terrible weeks after reverting to horribly predictable play calling.